The BRCA Gene….Should you (man or woman) get tested for the BRCA gene mutation? 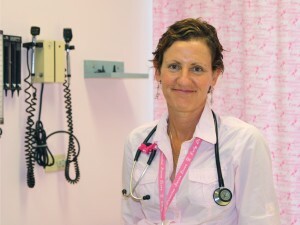 Dr. Ginty is Family Physician and Cancer Survivor. Regional Primary Care Lead for Cancer Care, Cancer Care Ontario, Mississauga/Halton. Listen to Dr. Ginty’s passionate and powerful message – it will inspire you to strength when faced with hardship. “It hits you blindside when all the balls are in the air – mum, doctor, tennis team…… delete. Bilateral breast cancers, double mastectomies, reconstruction, 3 axillary node surgeries, BRCA 1 mutation discovery and hysterectomy. Then back to busy work. A journey of empowerment & strength – now to give back even more as a voice from both sides. Well, it was fortunate that I came across some remarkably lucky opportunities as stars aligned. As my cards said, I had to step up to the plate if I wanted to change the emotional fallout of cancer treatment and how it could look different if I wanted it to. Passion + opportunity and here I am. I still have to push the comfort zone and push the barriers of media savviness or get left behind. Please join us – Laugh and cry, but knowledge is power. Thank you for sharing. This is really helpful.